We live in stressful times, there is no denying that. Meditation is a wonderful tool that is available to everyone which helps create calmness, peace, relaxation, wellness and clarity. With practice, meditation keeps us more in the present and focused throughout the day; free from distracting thoughts and worries. When choosing an essential oil for meditation is is important to choose a scent that does not evoke a memory as this will send the mind exploring the past. You also want to select an oil that is not used everyday. Use something new and different to escape your ordinary existence and lift you into a more spiritual realm. If you only use this oil during your meditation practice, your body will “remember” that you are entering into meditation. Over time it will be easier to enter into the meditative state more quickly. The right essential oils can enhance the meditation experience by facilitating relaxation, enhancing clarity and deepening a spiritual connection. One of the most important factors in choosing an essential oil is its purity. Make sure you are only using high quality essential oils from a reputable company and not getting an adulterated essential oil or fragrance oil. Fragrance oils are chemically made whereas pure essential oils are the actual scent of the plant. Using essential oils is called aromatherapy; using scent to affect the emotions. 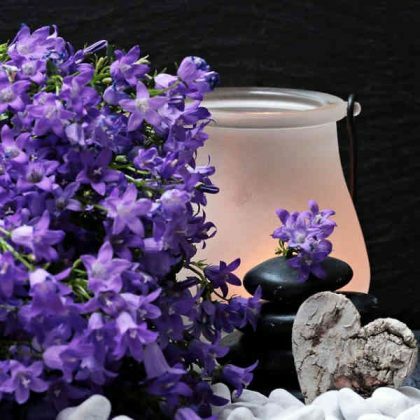 Essential oils, or a blend of oils, will provide something to sensually focus on during meditation; much like a candle, meditative music or flowers. Frankincense (also known as olibanum) is one of the most spiritual essential oils available. It is derived from the tree resin of the Boswellia tree and is one of the three gifts mentioned in the bible. Frankincense makes up the incense that is used in the Roman Catholic and Greek Orthodox churches. It has long been used for sacred rites and rituals because of its overall health benefits and its high vibration energy. Frankincense helps clear and purify the auric field making it a great oil for meditation. The aroma is considered warm, sweet, spicy and balsamic (earthy, woodsy, grounding). Sandalwood oil is another wonderful oil for meditation. The scent of sandalwood promotes serenity, sensitivity, peace, harmony, unity and insightfulness. Sandalwood is one of the most important fragrances used in Indian religious practices. When purchasing sandalwood essential oil, it is very important to make sure that it has been ethically harvested and also to make sure that it is pure. Sandalwood oil is commonly found diluted in a base oil because of the cost. This is okay to use but not in certain types of diffusers. The aroma is considered warm, rich and woody. Jasmine oil has a captivating, soothing floral scent. For some, the floral tones may be to strong but it is another of the oils for enhancing a meditative state. This is one of the most expensive essential oils available so again, it is important to purchase from a reputable company to know it isn’t a fragrance oil. Like sandalwood, it is common to find this oil diluted in a carrier oil. Holy Basil (also known as Tulsi) is grounding and balancing. It helps increase clarity, strength, concentration, positivity and enthusiasm. The aroma is warm, rich, peppery and aniseed-like. Vetivert is very grounding thus helps calm an overactive mind which allows the answers we are seeking to unveil themselves. The scent of vetivert is warm, soothing and comforting but quite earthy. Cypress is a nice grounding oil that helps with change, letting go and going with the flow of life. It is said that the scent of cypress helps connection with the wisdom of the universe. Cypress is comforting, balancing, promotes inner peace, stillness, patience and understanding. The aroma is woody, warm and slightly spicy. Cedarwood is commonly used for “smudging” or cleansing the energy of an area or for spiritual purification. The scent is said to encourage strength, focus, balance, persistence, concentration and confidence. The aroma is warm, sweet, soft, woody and earthy. Grapefruit essential oil energizes or awakens yet relaxes the mind. The oil encourages joy, positivity, confidence and spontaneity. Grapefruit reconnects mind, body and spirit making it ideal for use during meditation. Lavender: I was hesitant to add Lavender to the list because it is such a common scent but it can provide deep relaxation and a sense of calm. Personally I feel that Lavender is better used at night to promote a restful, deep sleep. Essential oils are highly concentrated and some must be used with caution. With a few exceptions, essential oils are never used directly on the skin (neat) or taken internally. For safety, please read more about any oils you might use as they also work on the physical level. Pets are very sensitive to some oils. For meditation, essential oils are either diffused with a diffuser or used on the skin mixed with a base oil such as sweet almond, apricot kernel or coconut oil. (Rocky Mountain Oils are very high quality and I am honored to have been accepted into their affiliate program recently. To comply with FTC regulations I am disclosing that this post contains affiliate links which only means if you purchase through one of my links, I receive a small commission). PrevPreviousWhy Become a Reiki Master?